Sorry it’s been so long since I wrote. My other website is up and running, and I’m overdue to write another blog post for that one. The focus is technology, not cooking, so it’s a little more work, ’cause I gotta READ, not write off-the-cuff like I do here. I do research for this blog too, but I know more about cooking and baking than I do about Big Data and Cloud Computing. But hey–cooking and technology are important, and frequently they overlap. Especially when I get a new catalog from Sur la Table. If you don’t want to see really expensive and complicated coffee machines, don’t click on that link. I have some updates on the garden to share soon, but I definitely need to get out there and weed some more before I show you any pictures. The second Anaheim chile pepper was used Sunday for this delicious dish, and the Meyer lemons are starting to turn yellow. JUST starting, like limes, but it might be a month before harvest time. The other day I put one of my cookbooks back and I saw a book given to me by a guy I used to date. He lived on a boat, and he had to say goodbye one day, but I did find out that boat sank during Hurricane Ike in 2008 and he’s a land-lubber now. No, I don’t want to see him again, but he did give me a copy of The Yachting Cookbook. No kidding. It’s out of print, but Amazon still has copies from individuals for sale. All 14 reviews are 5-star, and everyone raves about how great the recipes are–both in simplicity and taste. I’ve never used it. I’ve thought about it, though. Helpful stuff like that. I’ll let you know if I try it. Let’s get excited about. . .kale. . . .
Kale’s OK, but no, I can’t get excited about it. 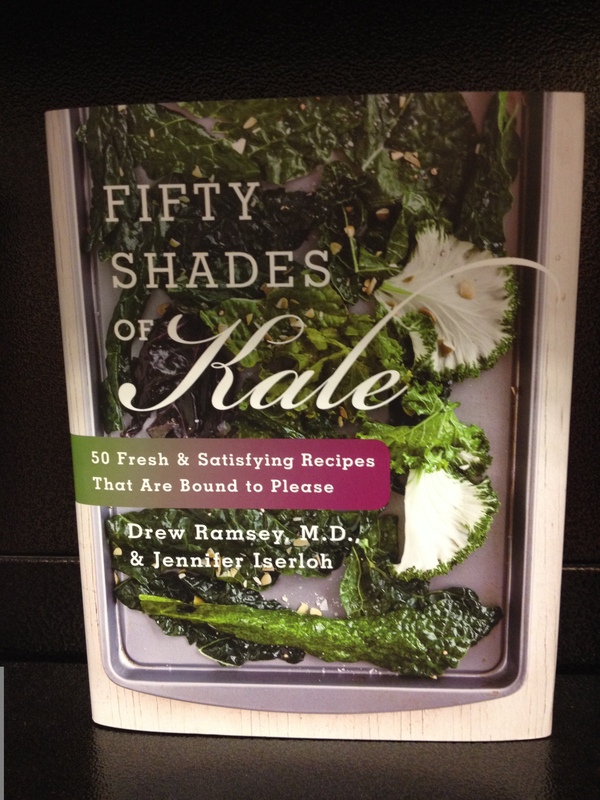 But if you are just wild about kale, go get the book and get cooking. I have been trolling through Barnes & Noble occasionally, and just found it recently. Maybe I need a life. These days I wonder what my late Grandmother O’Donnell would think about all the stuff available in American grocery stores. She passed away in February 2005, six months before Hurricane Katrina wiped out her house (it was long ago sold.) My grandmother took me to the grocery when I was little, like 4-5-6, and that’s how I learned to grocery shop (because Moms know grocery stores are the worst place to take kids.) Yes, these were the halcyon days of Suzy Homemaker and the Easy-Bake Oven. 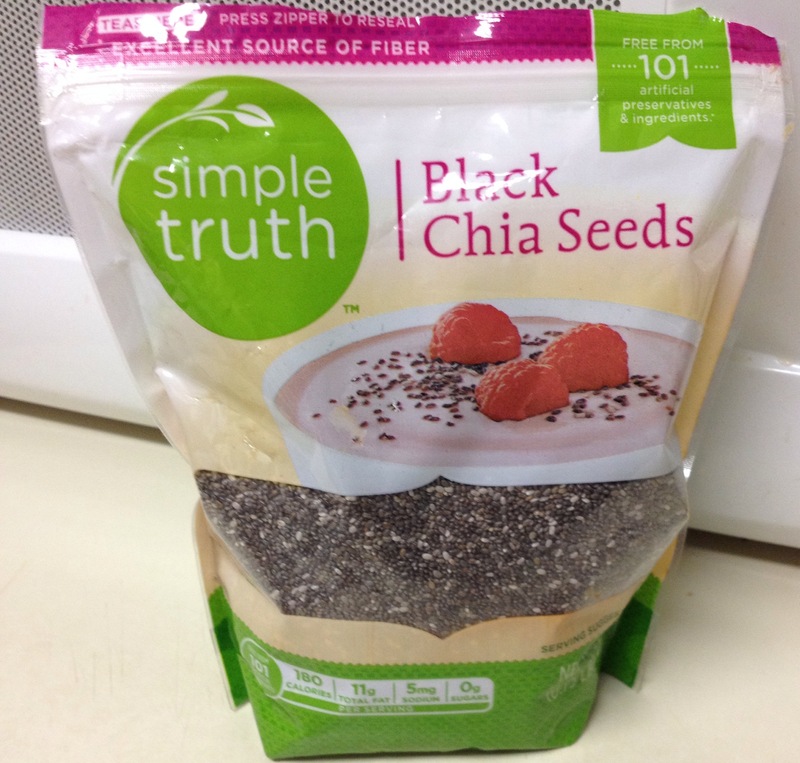 A couple of years ago, I ordered something online that came with a sample of chia seeds, exactly one quarter cup. Did not know what to do with it, but a little clicking around found this recipe for Chocolate Peanut Butter Chia Pudding Loved it, never made it again, but I’ll make it again one day. Later, on a trip through Trader Joe’s one day I found a bag for about $4 or $5, so I got some, even though I didn’t know what I was going to do with them. I’ve since found them in Kroger for a better price. Kroger’s brand of chia seeds. Bigger bag for less money. And then Giada de Laurentiis’ new book came out, and I found another use for chia seeds. 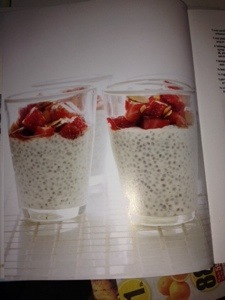 I made some of the Chia Seed Pudding on page 29, and happened to have most of the ingredients handy and gave it a try. Because I had such long days, I took this to work and had half of it about 10:00 am, and the rest about 4:30 pm. It was pretty good, too. However, keep reading. . . .
Chia seeds are kinda funny–they’re little bitty, but leave them in liquid for a while and they plump up and make a pudding-like texture. (If you put them in a smoothie and don’t consume the smoothie right away, I think you can guess what will happen to the texture your smoothie.) However, chia seeds are very nutritious, and can also do a stand-in for other thickeners in some things. They’re also filling with lots of fiber–but no phytoestrogen like the celebrated flax seeds, which are touted as helpful to menopausal women, but can actually mess with or mess up your hormones. Lucky me, I had all the ingredients on hand, but used agave syrup with a little maple extract in it instead of the maple syrup. And so I made it regularly. Delicious! Now, because I was working in an office with people who loved cupcakes, cakes, sandwiches and pizza, I had a tough time leaving it alone and eating clean, and I fell off the wagon a couple of times. But this was a healthy new treat, and I so enjoyed it daily. I bought my usual frozen fruit that I was buying for smoothies and added that on top. Looks good, doesn’t it? Amy’s version of Giada’s Chia Pudding, with a cherry on top. It didn’t look this good when I took it to work, but it sure was tasty. And then one day I thought my appendix had ruptured. My gut was killing me, and I was a couple of days away from going to the emergency room for an X-ray and possibly surgery. Just what I needed. I backed off eating the pudding, and go back to smoothies. . .and the pain went away. Remember that chia seeds swell up, and have LOTS of fiber in them. And I guess after a few days, they swell more and more. Smoothies don’t do that. You can find a different recipe for Vanilla Chia Pudding at Martha Stewart’s website, but here’s the recipe from Giada’s book. You make stir it up the night before (no cooking!) 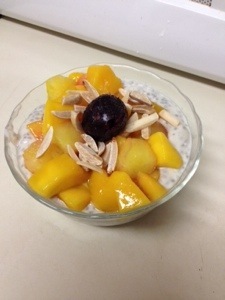 and it’s ready in the morning–just top with fruit and slivered almonds and you’re ready to eat. In a medium bowl, gently whisk the almond milk, yogurt, the 2 tablespoons maple syrup, vanilla and salt until just blended. Whisk in the chia seeds. Let stand for 30 minutes. Stir to distribute the seeds if they’ve settled. Cover and refrigerate overnight.